We hope everyone had a great summer, we sure did! Now that the days are growing shorter and we are making our way into football season, we will be kicking off some new events that you can check out on our event page! 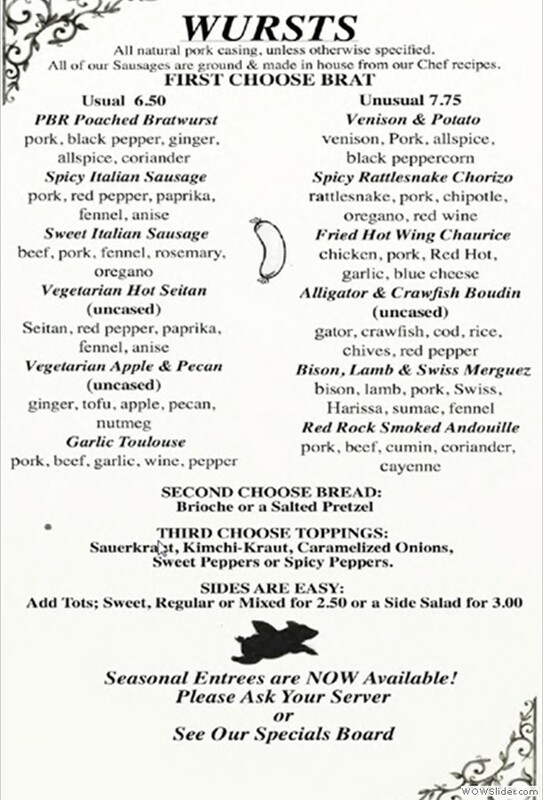 If you have not stopped by in a few weeks, we have implemented some new menu items and the sausages we get smoked at Red Rock are flying out of the doors... Stop by and try some! And, amazing thanks to Jenny Wolff-Harrison photography for the great shots of our establishment! $2.99 delivery charge. East to Wiard, West to Hogback, North to Clark and South to 94 will be our initial operating area. We will post a more defined map later! Also, depending on driver availability and an additional fee, we may deliver further. 8pm- 2am! Brats and beer! 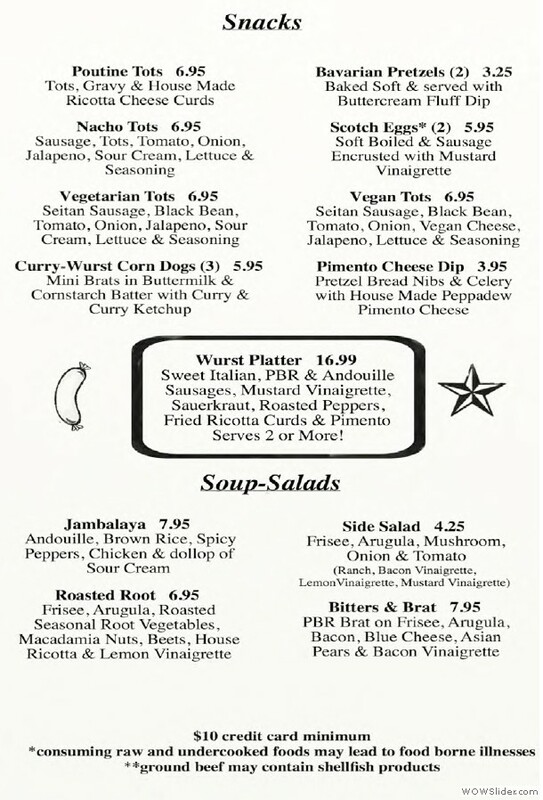 Call 313-75-WURST or 734-485-6720. Thanks! 4PM-6PM HAPPY HOUR, EVERY DAY! $1 off all beers & $1 off all Apps $2 cans of beer; Atwater Lager, Hamm's, PBR, Stroh's $15 Pitchers of PBR or Miller Light & 4 Shots of Bulldawg or Old Crow Reserve. We will be implementing some live entertainment at the Wurst... Probably not what you would expect, but one Monday night a month we will be featuring live dinner music with a great featured dinner that will be paired with wine or beer. The dinner feature will be $28 per plate, worth every penny (for those of you that came to Kelleys Island and visited our other restaurant, you know what we are talking about!). 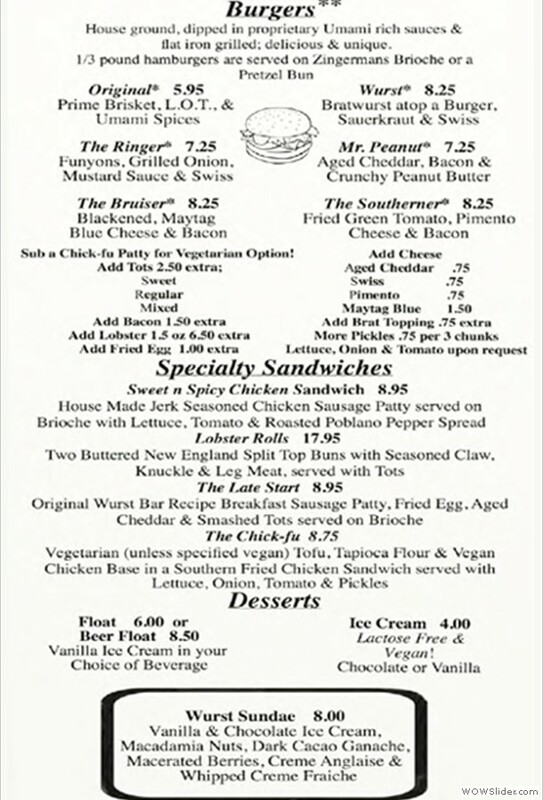 This is additional to our normal menu, so you can still get the Brats and Burgers. These should kick off in September so stay tuned! Each purchase of anything gets you 3 Bingo Cards.....Its serious fun, win $$ to buy stuff! Our surly bingo caller doles out 1970's putt-putt trophies and $100 in cash prizes every week. $3 Call whiskey shots 8-CL... We have loads of different whisky's! $2 wells, as in; well who isn't going to be a little salty after a few of those?? This one gets a little confusing (for you, not us), because we are doing something different every Sunday! Stop by around 8pm to find out what our secret Sunday event will be... heres a hint- you can win $$ and prizes two out of four Sundays EVERY MONTH starting September 9th! Is there a Sunday DETROIT LIONS Football game on? Then we will be tailgating so you don't have to! Stop by our party we will have the game on, the volume up, the wifi downloading all your fantasy stats and... $10 will get you a Burger or Usual brat, Tots and a Pint of the Bubbly... EVERY LIONS SUNDAY GAME! The Wurst Bar is new to Ypsilanti this year, opening at the beginning of January after we took over the bar formerly called Theo's at the end of 2011. 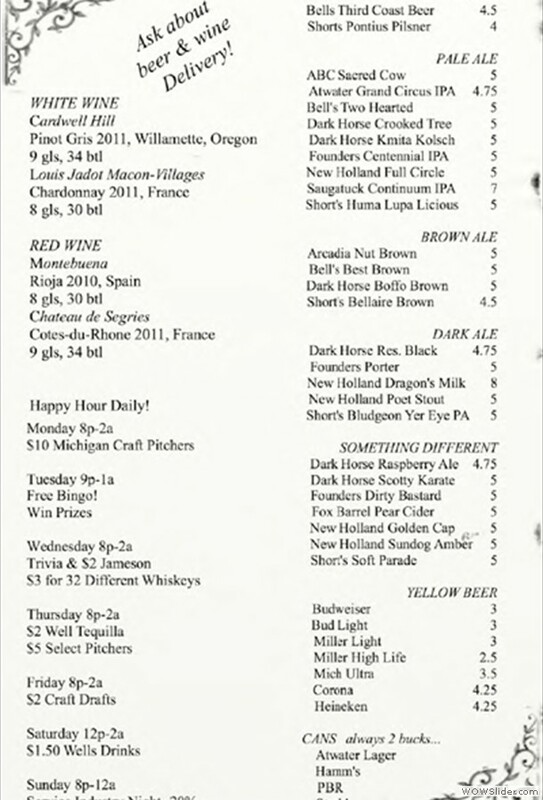 We feature house made burgers and brats, locally sourced products and delicious Michigan beers. Since opening we have received a lot of GREAT community support and we even won a Metro Times 'Best Of' award for 2012! The Wurst Bar management is available for questions, requests and, hopefully not too many, complaints! Our number is 734-485-6720 for basic questions. Have something else to ask about? Feel free to text or call Jesse anytime at 248-719-6362, leave a message and he will get back to you.